I got the chance to take a sneak peek backstage at some of my favourite shows at NYFW this season with the Moroccanoil team and today I wanted to share the looks with you all, as they were all incredibly wearable and easy to achieve at home. I noticed there was a real focus on texture this year, with undone, casual styles being a trend across all the shows I saw, not just the ones I was backstage for. There were also a few stand-out sleek styles in the mix too, my favourite of which I’ve shared below – Let me know which is your favourite! First up for Zac Posen. To contrast with the structured dresses and feminine tones, the team went for a messy, textured wrap-over style that offers a modern twist on the half-up-half-down look. They used 1/2 inch curling irons to create loose, messy waves, breaking them up by flipping the models’ hair upside down and spraying it with both dry shampoo and the Moroccanoil Dry Texture spray (which actually launches in the UK later this month – just a heads up, it’s really nice). They then pulled the central sections of the hair up and towards the back of the head, giving volume at the roots, then took sections at random from either side of the head and pinned them loosely into place to create a messy, natural look. Finally pulling out a few pieces at the front to frame the face and finishing off with hairspray to keep it in place. I absolutely loved this look as it’s different to what I’ve seen before, but still wearable and easy to re-create at home. It’s the perfect look if you want something chic and put together, but not fussy. 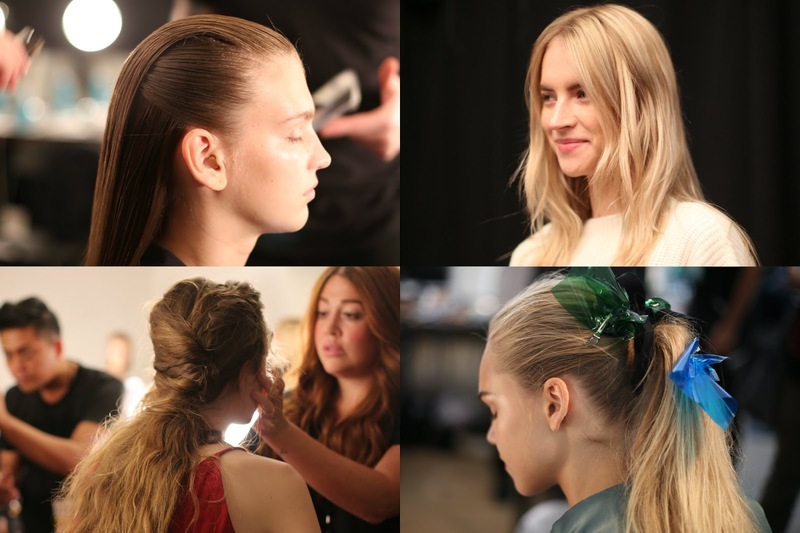 For Vera Wang’s show, the Moroccanoil team created an ultra-natural look. The models’ hair looked like they’d woken up like that (if they all had naturally amazing hair texture, obviously!). It was a slightly different look for each girl depending on their hair length, colour and texture, but overall the look was loose, tousled texture created using hair straighteners by moving them from side to side in the hair to create subtle movement, then using a tiny bit of Blow Dry Concentrate through the ends to create a little bit of separation and definition. It was also pretty awesome getting to see Vera herself overseeing the hair and makeup, taking pictures of the stylists at work and chatting to the team! Possibly my favourite hair look from all of the runway shows I saw in New York last week happened to also be my favourite show on the design front too… Monique Lhuillier’s show was impossibly beautiful, from the light-filled venue to the rose gold and pastel tones throughout the collection, it was topped off by an edgy, yet feminine textured pony tail tied with a simple grosgrain black ribbon. To create this look they applied Moroccanoil’s volumising mousse to the roots of the model’s hair when it was dry, then rough-dried it in all directions for a wind-swept look (They actually called it a ‘convertible’ blow dry – hilariously accurate!) The hair was then pulled into a mid-pony just above ear level and sprayed with dry texture spray, then loosened up with the fingers and pulled out a little in the front to add messy texture and set with a little hairspray – This is definitely something I’ll be re-creating at home, I absolutely loved this look, especially the touch of girly-ness added by the bow. Last but not least for Marchesa. The team created a look very similar to one that I wore at the Bafta’s back in February (If you guys remember – I did a GRWM video that you can see here.) A slicked back half-up-half-down style with the sides swept back under the top section of hair. They also accessorised the hair with beautiful pins slipped into the side sections. To create this, they used the original Moroccanoil treatment all over the hair, along with Heat Styling Protector before straightening the entire head of hair, then adding more and more oil until they got a smooth, slick finish (which looked amazing, but the next show must have hated them!) They then sectioned off a horseshoe section at the front of the hair, while pulling the two side sections back into tiny pony tails, combing them smooth in the process, then smoothing the top section back over the ponytails to cover them. Hairspray is essential to keep this style in place, especially if you’re wearing it IRL and moving about more than the models would have been on the runway. I also absolutely loved the makeup from this show, which was created by Bobbi Brown (I took a quick snap of her working her magic below) but the glossy, metallic, ethereal look was the perfect match for the hair. If you’d like to take a look at the actual shows and see what else I got up to in New York this week, check out my vlog below… I’ll be doing a similar post from London Fashion Week this week so come back in a few days to check that out too!